February is American Heart Month, a great opportunity to raise awareness about what Americans can do to live heart-healthy lives. 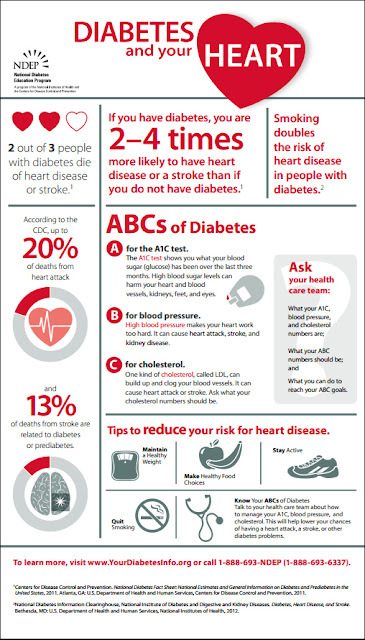 People with diabetes can take steps to lower their chances of developing heart disease and other heart problems by managing their ABCs of diabetes – A1C, Blood pressure, and Cholesterol – and stopping smoking. Share this new infographic from the National Diabetes Education Program (NDEP) to raise awareness about the ABCs of diabetes and the link between diabetes and heart health. Visit www.YourDiabetesInfo.org/Heart for additional resources to support your American Heart Month activities. what is diabetes treatment? Diabetes mellitus (DM), commonly referred to as diabetes, is a group of metabolic disorders in which there are high blood sugar levels over a prolonged period. Symptoms of high blood sugar include frequent urination, increased thirst, and increased hunger.